Sri Lanka insists that it is fighting a war against the Tamil rebels, and not the Tamil people. The daily Armed Forces' Bulletins and Press Releases from the Ministry of Information claim casualties to be always that of rebels. 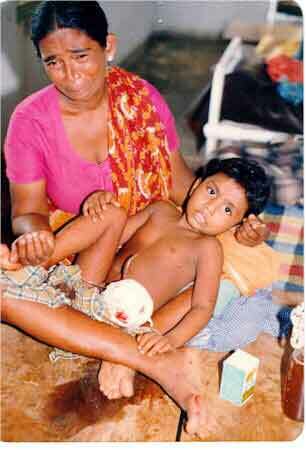 Tamil civilian casualties are regularly denied. "When defense sources say two LTTE arms factories were destroyed in another air raid on 30 July in Vaddukkottai, it means Jaffna student Thayaparan Muhunthan, 20, was blown apart and ten others including two-year old Sunthararam badly injured"
This photo gallery shows how the Sri Lankan armed forces deliberately target Tamil civilians. Since 1995, Sri Lanka army has intensified the artillery shelling (hitting targets 18-20 miles away) and the aerial bombing (from cargo planes) with unparalleled fury.